It’s no secret that technology trends are impacting what customers expect from businesses. In an age where you can request an Uber instantaneously or have an Amazon product delivered to your front door in less than an hour, the bar is suddenly raised for other industries to keep pace. Take the insurance industry, for example. Facing increased competition and an influx of young, tech-savvy buyers, insurers in all segments can no longer get by on “good enough” when it comes to service. If carriers, agencies and brokerages hope to survive, they need to understand what their customers expect in the modern insurance transaction and how technology can help them not just meet, but exceed those expectations. This report can help. Below, Software Advice reveals the results from a survey of nearly 300 consumers who bought insurance within the past two years, asking them how insurance technology trends impacted their purchase decision. Software Advice examined these results and explain how dedicated insurance software can help you attract and retain customers. In a competitive industry, reliable service can give you an advantage. 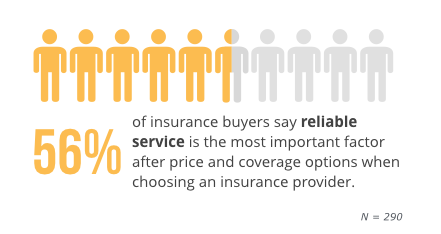 After price and coverage options, 56 percent of insurance buyers say reliable service is the most important factor when choosing an insurance provider. Offering online self-service capabilities is a must. 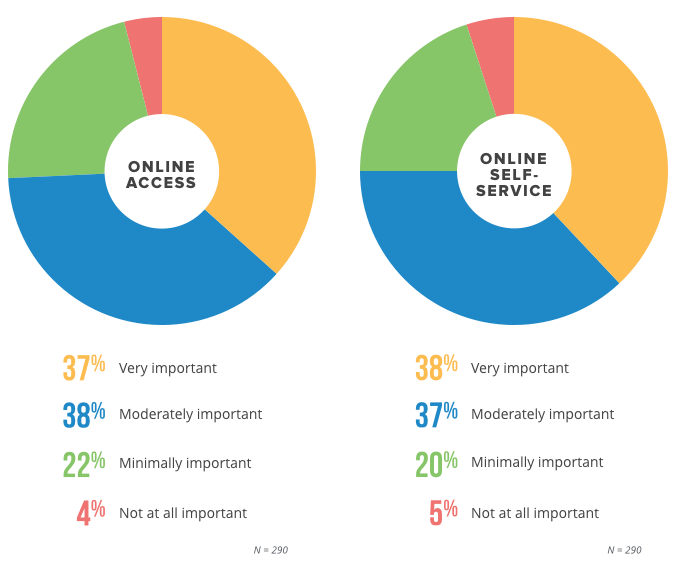 More than a third (38 percent) of insurance buyers say online self-service is “very important” when deciding which insurer to do business with. What software you use can matter to insurance buyers. Thirty-one percent of insurance buyers say an insurer’s use of dedicated insurance software over other types of software would impact their decision to use that insurer’s services. Direct insurers are impacted most, but agents and brokers matter too. Nearly two-thirds (64 percent) of insurance buyers made their most recent insurance purchase directly through an insurance company, while 30 percent used an agency or brokerage. Where in the past, insurance customers might put up with the occasional misstep due to lack of options, today’s buyers have no such patience. A survey by customer experience consultancy Quadient last month found that more than half of consumers (52 percent) believe they have more power than they did five years ago, with three-quarters (77 percent) adding they would ditch insurance businesses that did not meet their expectations. Convincing buyers that nothing with their policy will slip through the cracks is going to be crucial for you moving forward. But with more buyers purchasing insurance online than ever before, you have to take a multi-pronged approach to get this message across. That means you need to be continually monitoring your reputation on third-party sites like Consumer Reports and J.D. Power, intervening with customers to get feedback on areas of improvement to improve the scores from these increasingly trusted sources. 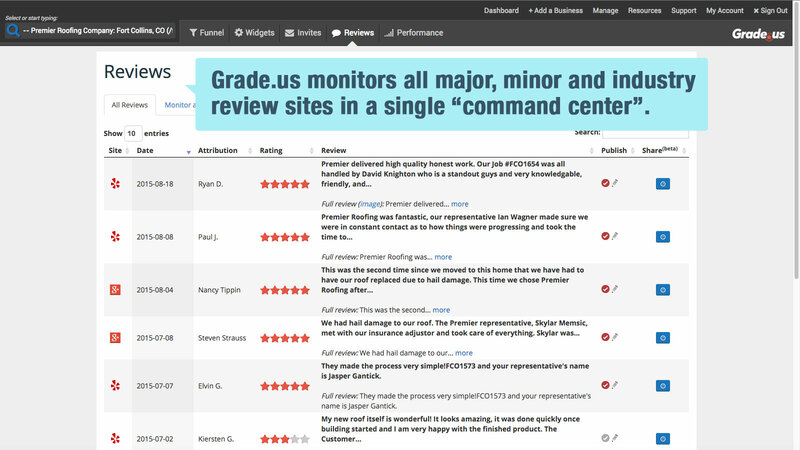 Rating monitoring in Grade.usYou shouldn’t ignore what your own website is saying either. For example, it may be time to drop those “Get Your Quote” tools that four out of five buyers don’t believe are accurate. Most importantly though, you need to support your claims and put the people, processes and technology in place to offer your touted reliability. In the next sections, we’ll go over how dedicated insurance software can support these efforts. The initial purchase isn’t the only area where insurance customers are increasingly flocking online. More and more, consumers expect to be able to manage their policy or monitor the status of their claims themselves, without the hassle of calling a phone number or driving to an agency office. Just as important was the ability to login and actually make changes—a.k.a, self-service—cited by 38 percent. Only four and five percent of respondents respectively said these capabilities weren’t important at all. For customers, it gives them their preferred method to find answers and make basic changes to their account, increasing service flexibility and improving the customer experience at the same time. And for employees, it frees them up from having to dedicate time to tedious service tasks like changing an address or checking the status of a claim to instead focus on more impactful strategic initiatives. Sweetening the deal is the fact that implementing these self-service capabilities no longer requires a significant IT investment. Through standalone portal software, or an integrated portal within a dedicated insurance software system, you can set up a branded self-service portal, accessible through your company website, so customers can update their policy, pay their bills and more. As customers change their information or submit a claim, it automatically gets updated for your team on the back end. Some vendors even allow for self-service through a dedicated mobile app, something you may want to consider to cater to younger buyers. A study by omnichannel service vendor V12 found that 88 percent of Generation Z and 77 percent of Millennials ranked access to info and service via apps as important to insurance purchase decisions. When we talk to insurance businesses looking to purchase software, we often find they rely on a variety of systems and tools to cover their needs. 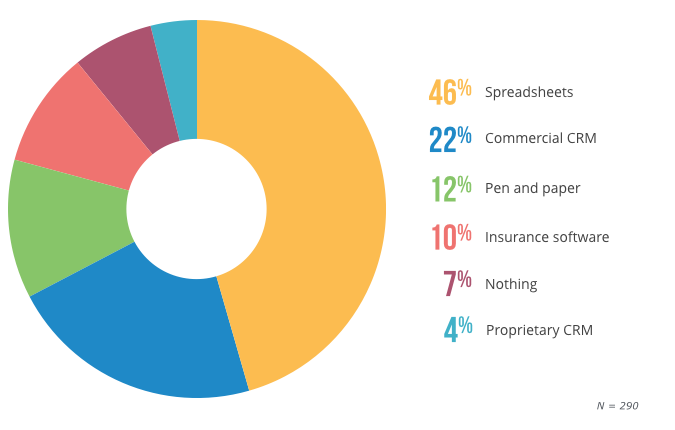 Looking at a random sample of 200 interactions with insurers looking for customer relationship management (CRM) software from this past year, for example, we find 46 percent currently rely on spreadsheets, 22 percent already have a commercial CRM they’re looking to replace and only 10 percent use dedicated insurance software. The prevailing thought seems to be that as long it gets the job done managing customer needs and enabling agents to do their job, it doesn’t matter what you’re using. It’s not like buyers are going to care what type of system you have in place, right? As it turns out, they might actually care. When we asked respondents if they preferred their insurer to use dedicated insurance software, as opposed to software not built for insurers or manual methods like spreadsheets, nearly a third (31 percent) said they’d prefer an insurer that uses insurance software. Though non-insurance systems can cover some bases related to customer and back end management—and in some cases may be vital for specific needs, like accounting or payroll systems—insurance software provides important functionality you can’t find in other platforms. Policy management Create, administer and manage policies for various customers across insurance lines. 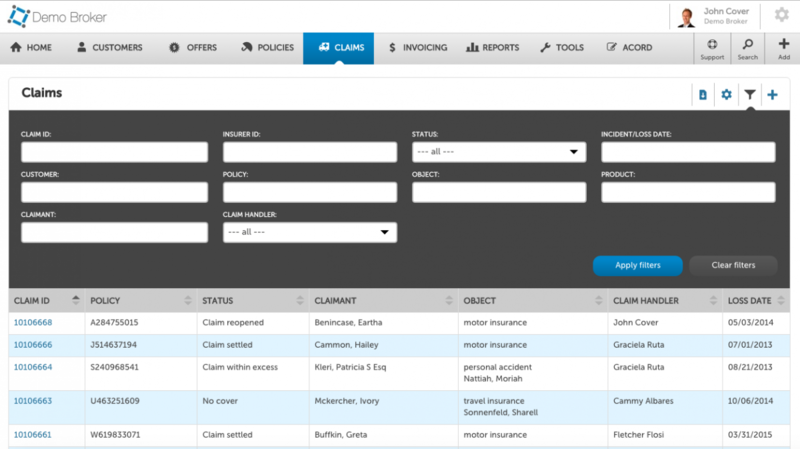 Claims management Manage customer claims information and track the status of claims that are in progress. Rating Receive quotes from partnered insurance carriers in real time based on customer information. Underwriting Define formal rules for customer coverage company-wide. Enter information to determine risk of insuring. Claims management in InslyHaving dedicated insurance software in place can improve process efficiency, team communication and regulatory compliance. At the same time, as we discovered with our survey, it can also reassure customers that they’re getting the reliable service they desire. But it’s not just the P&C segment that should be paying attention to technology trends. 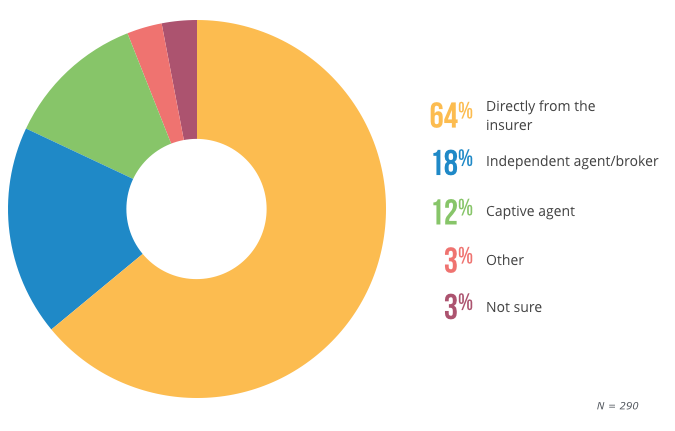 To get a sense of which branches of insurance customers are bringing their heightened expectations to, we asked respondents what their most recent insurance purchase was. More than half (56 percent) purchased auto insurance, 24 percent purchased health insurance and 10 percent property insurance. 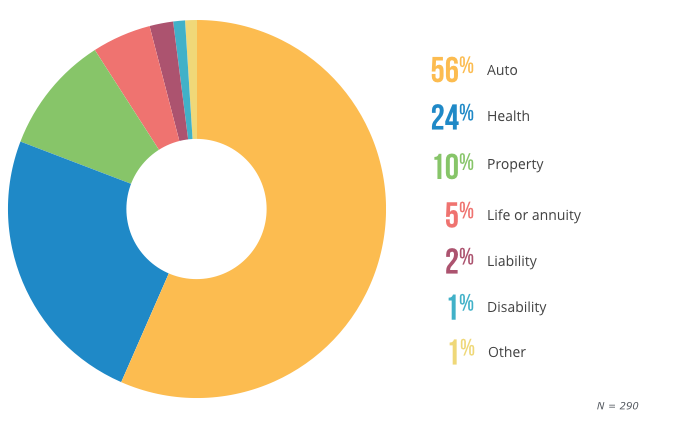 And while most of the respondents (64 percent) bought their insurance directly from the carrier, insurance agencies and brokerages still played a role in 30 percent of purchases. The fact is all aspects of the insurance industry are affected by the digital experiences that consumers have come to expect from other purchases they make in their lives. Whether these expectations are fair or not, it behooves insurance businesses to invest in the right technology to not only optimize back end processes, but to also satisfy customer needs on the front end as well. To learn more about different insurance software products, head to our insurance software page to read reviews and compare system functionality. 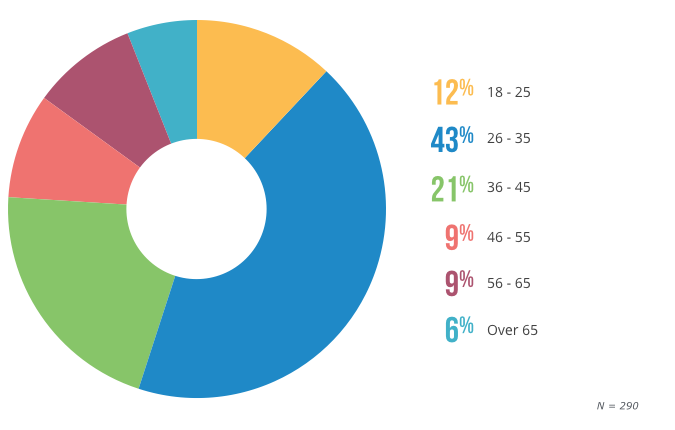 In terms of age, 55 percent of respondents are between the ages of 18 and 35—emphasizing the influx of young buyers to the insurance industry. 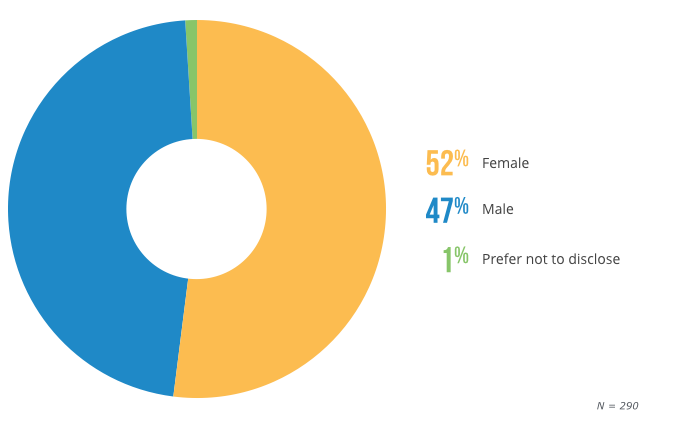 Survey Respondents, by Age Original article is written by Brian Westfall. Brian Westfall is a Senior Content Analyst with Software Advice. He covers the HR and LMS software markets, focusing primarily on recruiting, performance management and payroll. He holds a B.S. in Marketing and Economics from Trinity University. His research has been cited in various publications such as TIME, AdWeek and Entrepreneur. Read the full article on SoftwareAdvice.com.